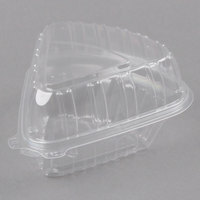 We carry plastic pie containers that can hold individual slices, as well as options that can accommodate an entire pie. Many of these containers come with dome-shaped lids, as well, to accommodate pies with toppings, meringue, or whipped cream. You’ll also find tamper-evident pie take-out containers that will let customers know if someone has tried to open the packaging. Also make sure to check out other great items from D&W Fine Pack, Dart, Genpak and Polar Pak. By stocking up on these plastic pie containers, you’ll be able to sell whole pies in your bakery or send customers home with dessert in your restaurant. Their compatible lids easily snap into place, so you can rest assured pies will stay secure during delivery or transport. Best of all, these containers are disposable for quick and easy cleanup! For more great products to prepare treats in your bakery or restaurant, check out our pie pans, pie cutters, and pie fillings. If you're wondering where to buy dart pie take-out containers, we have a large selection of dart pie take-out containers for sale at the lowest prices.